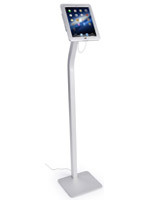 50-1/2" Floor-standing unit holds generation 2, 3, 4, and Air iPads for a high-tech presentation. 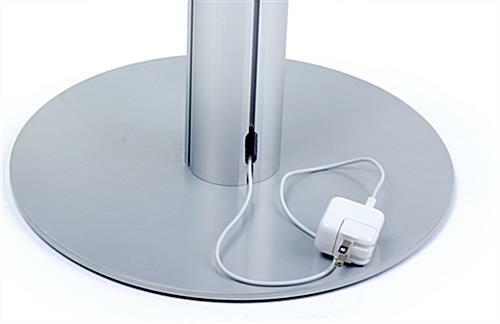 In-post cord management hides charging cords from public view. Steel constructed locking enclosure prevents theft and tampering. 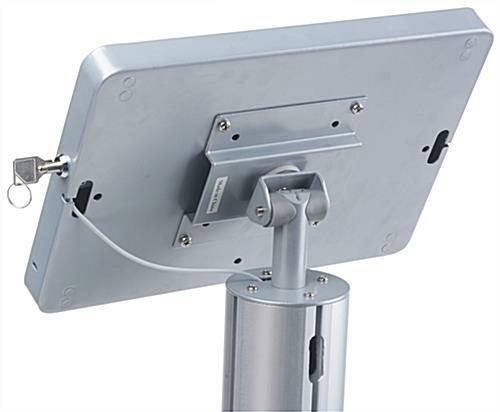 Full tilting and rotating ability to position enclosure at the ideal viewing angle. These silver iPad kiosks are a great addition to a variety of businesses such as retail stores, restaurants, hotels, and many more locations! A secure display is a smart purchase for high traffic public areas. 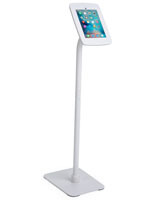 A variety of iPads are compatible with these ipad stands for Apple devices. This floor stand is durable and designed to last. 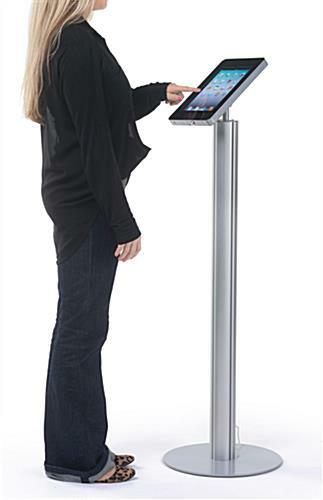 These iPad kiosks, that are POS solutions, have a stable base preventing the unit from tipping over while in use. The secure display has a sleek silver finish and a silver enclosure with black faceplate. 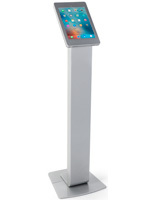 IPad kiosks, also known as POS solutions, are just one among many floor-standing units available here. The secure display covers the ports and home button for public use and for tamper prevention. 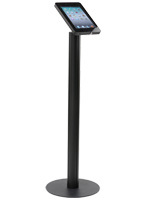 All iPad kiosks with locking enclosures have full rotation ability. The floor stand can be positioned in a horizontal or vertical orientation. 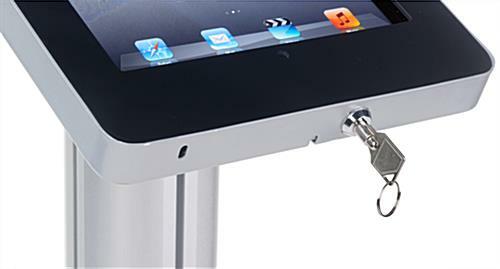 These iPad kiosks, that are secure displays, keep the Apple device safe from theft and damage with the locking enclosures. The POS solutions also hide cords from public view. The iPad kiosks, that have cable management, have space for holding charging cords. 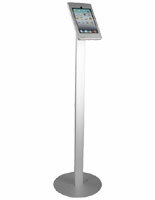 The silver finish floor stand suits nearly any environment. The locking enclosures, iPad kiosks are ideal and affordable purchases for retail or commercial environments! This floor stand is a high quality build that fit my iPad Air 2 perfectly, enabled me to hide the cabling away, and withstood the beatings of a busy retail environment very well. On top of that, I ordered this product on Monday, 15 October with normal Ground shipping selected and received it the next day. We are very happy with the stand- looks good and plan to order more! Thank you so much for not only sharing your feedback with us, but that of your very own customers. 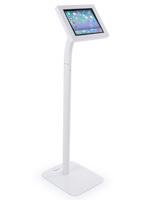 We are thrilled to hear the the iPad holder has helped make your operation more efficient! Thanks for this awesome review! Very easy to put together. Product is extremely durable, definitely worth what we paid. Stylish and modern, looks great in our showroom. Would recommend this product to other businesses. We're so glad you're satisfied with your floor stand, Karl! 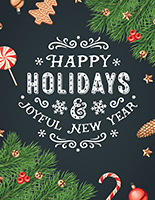 We'd love to see a picture of it in your showroom -- we're sure it looks great! I wanted a sturdy, secure iPad enclosure to house a kiosk in our high school library, and this is perfect. It's attractive, durable, and keeps the iPad locked down and in kiosk mode all day. Love the cable management that allows us to keep the iPad charged. And, it only took a few minutes to assemble! Thanks for the feedback, Christina! Your iPad stand looks great!